Most urethane products are manufactured as either Aliphatic or Aromatic product compounds. These names describe the basic chemical molecules which they are constructed from. An Aliphatic urethane molecule has more & stronger bonds within itself than an Aromatic urethane product. Aromatic bonds are so much weaker than Aliphatic, that U.V. radiation from the sun is able to break the atomic bonds in the surface which hold the coating together. This is when chalking & fading occur on a ute deck. Speedliner® is 95% Aliphatic and 5% Aromatic. Industrial Polymers is working on making Speedliner® 100% Aliphatic. Speedliner® competitors use 100% Aromatic product in their systems for the simple reason of price. If they were to change to an Aliphatic urethane product it would double their raw materials cost to install a deck liner. For example; A competitors product is made up of 2 parts. Part A is purchased directly from an outside company like Dow Chemical, BASF or Base of Huntsman Corporation. No additional manufacturing is required and it is ready to spray other than colour. Part B is a simple mix of chemical ingredient and no special manufacturing equipment is required. With Speedliner® the Aliphatic raw materials are far more expensive and both part A & Part B require cooking in a chemical reactor for long periods of time which make it difficult and costly to manufacture. This process is all done in house by Industrial Polymers which gives Speedliner® NZ the knowledge that every batch is of the same quality every time. Aliphatic urethane also allows for the use of bright colours without the risk of huge colour fade. 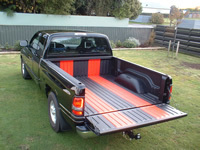 Speedliner® NZ is happy to give a full 3 year warranty against normal wear and tear. Speedliner® can be applied to steel, timber, alloy, new concrete, plywood and stainless. It has been used in many different applications throughout New Zealand and the world. Speedliner® has the ability to be mixed with other products such as rubber and grit which can be applied through a hopper gun. Speedliner® NZ in conjunction with Speedliner® Europe has developed an Antibacterial Hygiene coating for use in the food and dairy industry called Speedliner® HC. Speedliner® HC has now been certified for use in the dairy industry by AgriQuality New Zealand. It is ideal for use in food vans etc as it has all the properties of Speedliner® as well as anti-bacterial and anti-fungal properties. Top Coat 6 is another product manufactured by Industrial Polymers. This product has excellent colour retention and is perfect for attaining colour’s that are difficult for Speedliner® to attain. When using light colour’s such as white or silver in Speedliner® , Top Coat 6 must be used. When applying automotive paint tints with large amounts of pearl or metaflake it is recommended that Top Coat 6 is used. Top Coat 6 increases chemical resistance and enhances gloss.